"Life's Ladder"sounds like a blend of early rock folk,and psychedelic country. The album as a whole sweeps with beautiful melodies and old school tones. Jesse has created a timeless masterpiece with this record. Jesse Aycock wrote his first song at age twelve and wrote a song that ended up on his dad’s debut CD when he was fourteen. He has certainly come a into his own style since then, crafting his timeless brand of music. Jesse’s songs capture an innocence and honesty that is hard to find, He writes everything from story songs and love songs to songs about every day life and the human condition. In Jesse’s music you can definitely hear the influence of early rock and folk, psychedelic country, and soul all mixed together to create his unique sound. 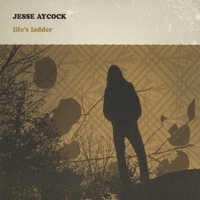 Jesse has just completed his first solo release, “Life’s Ladder” with producer and friend Jared Tyler. All songs except one co- write were written by Jesse Aycock. Contributing to the record are some of Tulsa’s finest musicians; Reed Mathis of The Jacob Fred Jazz Odyssey on bass, Brian Lee – studio musician for Leon Russel on keys, Josh Raymer on drums, Jared Tyler on various instruments, Don Geesling on Hammond B3, and guest Rachel Ries and Anais Mitchell on harmony vocals, Dylan Aycock on turntables, Dustin Pittsley guitar, Al Ray on bass, and Jeff Porter on Percussion. “Life’s Ladder” was mixed and mastered in NYC by Chuck Zwicky who has worked with Prince, Soul Asylum, and Jeff Beck just to name a few. “The musicianship is superb, and the songwriting –beautiful.” Folk Salad, NPR. Jesse has a great sound, and this CD pretty much proves it! With songs that are a little driffrent like Jerry Lee and with loves songs like "Take me in your arms" and "long distance love". An amazing CD all together Jesse is amazing and a real talent! I first heard this CD played on the AmericanaOK podcast. After hearing Eyelid Sky in went straight on my shopping list. Having now listened for the first time all I can say is WOW! This is one of my CDs of 2006, great songs, great early 1970s sound and a very unique voice. Buy this CD with confidence, it's a cracker! Lifes Ladder will definitely be on heavy rotation in my life for many months to come ...stand out tracks for me are the title track Life's Ladder- Burned and Osage Girl - which is probably one of the most beautifully haunting songs i have ever heard. Lush,layered, with Jesses voice which grabs you in an instant and never lets go. still playing my copy and have bought a further 3 for freinds. Its THAT good. every day a different track is my *Favourite* at the moment it is Long Distance Love....beautiful, just beautiful. Great melodies all the way through and a variety of styles ...this boy has it all.